These notes are based on our many years of experience in breeding Great Danes. Always remember there are many other sources of information available these days through the internet and in addition our international Quintessa Chat Group can often assist in providing hints and information based on personal experiences. For your convenience your puppy has been reared on Dry Food. There are several excellent products on the market such as Bonnie Puppy Food,. from which we are getting excellent results. We also combine this with the Pal Puppy Rice Based dry food. This is fed to the pups mixed with either a small amount of mince or some canned Puppy Food, to which we add a little hot water and serve up slightly moist. We prefer to use a variety of the products that are available and slowly start adding adult formula food such as Bonnie, Cobber etc. as the puppy gets older. We try to use products that utilise natural ingredients and do not contain preservatives or artificial colouring.. All the commercial foods contain a complete and balanced diet but do check ingredients. The puppy formulas often contain higher protein levels, which is necessary for younger puppies but anything in excess of about 24% protein is not recommended. We start adding small amounts of adult food to the dry puppy mix around 6-7 weeks, so slowly over the next few months, gradually increase the amount of adult formula and decrease the puppy mix. By six months of age, your puppy should basically be totally on adult food. Dry Food is much more convenient to feed and professionally formulated, so it is advisable not to spoil your puppy by offering alternatives. If you have any meal scraps, simply mix in with the next feed of dryl food. Remember that if you do feed meat (and this is NOT recommended, other than the small amount of mince for flavouring etc) it may be necessary to increase the calcium intake. However, if you are following our recommended diet, do NOT add any calcium. Should your vet advise extra calcium, please ring us for advice before doing so! Always remember that most vets are not in the business of breeding and do not always have the experience of knowing what a rapidly growing Dane puppy needs and requires for healthy growth. Young puppies do better on three meals per day. Two of these feeds (say early morning and late afternoon) are commercial dry food, moistened slightly and with a spoonful of either mince or sometimes other products that we have found convenient and palatable to puppies. ie:Scotty's Mince & Pasta Roll (available Supermarkets) of which a small amount can be chopped up and added for extra flavour. Last thing at night your puppy will enjoy some Weetbix and milk. Not too much milk as this can make the faeces rather runny. To this you can add an egg, but make sure the egg is first coddled (pouring some boiling water over the egg is usually sufficient), then add your milk and weetbix. (Raw egg destroys certain essential vitamins). Feeding times can be varied according to personal circumstances; just so long as a routine is developed and frequent feeds are offered at regular times. As your puppy gets older you can decrease the number of feeds per day, and your mature Dane (18 months to 2 years) could be fed once daily, although we have personally found that they do better on two feeds daily (same amount of food but split into two feeds). Twice a day feeding seems to also minimises the risk of Gastric Torsion (commonly known as Bloat). The amount of food required will have to be adjusted to your own puppy's requirements. If you overfeed a Great Dane puppy they tend to simply ignore their next meal, so try and gauge an amount that he will eat fairly quickly without leaving anything and then he will be ready for his next feed. Little and often is the best way to ensure a healthy puppy. Remember - your puppy is growing very quickly, so increase the amount of food accordingly. Try to feed your puppy from shoulder height. This will promote a good straight front line and is also much easier for a Dane to handle their meals. A chair, an upturned carton or a bucket that the bowl fits into, can provide an easy way of accomplishing this. Your puppy will enjoy the occasional bone (make sure it is large enough not to be swallowed) and these will also help with teething. The safest bones to use are brisket bones, because if the puppy does swallow some they can be digested. Even safer is a very hard biscuit (Farrells 4x2's) or the hide bones found in supermarkets. It is very important to realise that a Great Dane puppy grows at a tremendous rate. Our puppies increase weight around 1½ - 2 kilos (4 lbs) and also grow approximately 2 to 2½cm. (1") per week for the first few months. It is therefore imperative that they get plenty of rest and sleep - as well as a correct diet. Do not expect your puppy to walk for miles or play all day with the children. Try to ensure that the puppy always sleeps after a meal and does not get too active on a full stomach. If you maintain a daily routine of sleep, exercise/play, eat, and then sleep again, you will give those young bones a chance to develop correctly. There is an easy simply method of hassle free lead training. Get your partner/kids or whatever, to take you and puppy in the car and drop you off a few hundred metres away from home. Then when you are on your own, the pup will look to you for guidance and security and should quickly respond and walk alongside you. Don't pull, use a very soft lead and offer lots of encouragement. It really works!!! Toilet Training – Easily accomplished by being aware that puppies usually need to relieve themselves immediately after they wake up - and also, a short walk outside after a meal will usually be timely. 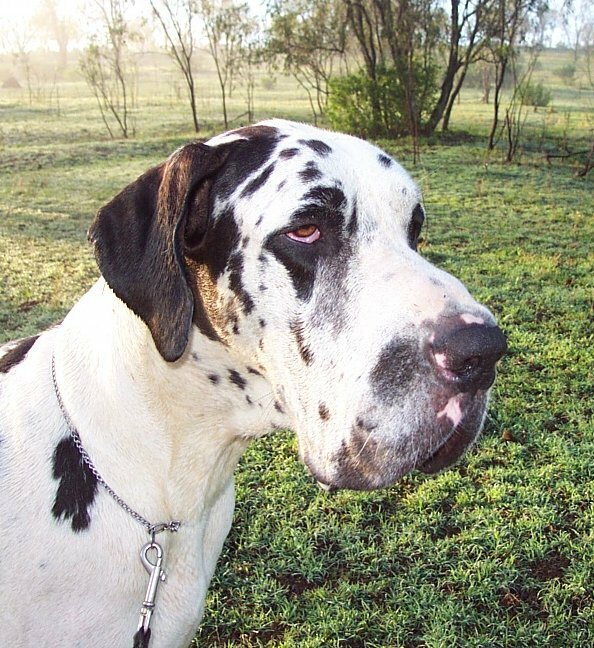 Vitamin C has proved very beneficial for a growing Dane and does help prevent some of the growth problems that can occur in many of the larger breeds. (Some caused by over-nutrition!). We recommend 2 x 500 g. tablets daily (readily available at Chemists). Cod Liver Oil Capsules are also very good, providing Vitamin A which promotes a shiny coat and general well-being. Your puppy has been given the first vaccination for Hepatitis/Distemper/Parvo. A certificate is supplied showing the date that you must take him for his next shot. Remember that "permanent" shots are not for a lifetime - they do need a booster yearly, so keep your Vaccination Certificate on hand to remind you when shots are due. There is growing concern also that dogs are often over vaccinated and that yearly boosters are not strictly necessary, but you need to discuss this with a vet (unfortunately most prefer to say they need it rather than do themselves out of an easy income). Information on vaccinations can also be found on various web sites. Your puppy has been wormed regularly. However, all puppies usually require worming on a regular basis, so please check with your Vet. Carrying a worm burden will not be conducive towards the good health of your puppy. A word of warning on your rapidly growing Dane. Make sure he/she spends sleeping time on soft bedding. You should do this to avoid elbow hygromas which can occur. Danes like to throw themselves down rather than just lie down softly. Nice soft bedding will help prevent this problem. A Hygroma is inflammation of the bursa, and the bursa sac on the elbow joint (sometimes other areas) fills with fluid. This is nature's way of protecting the joint. Prevention is better than cure. Remember that heartworm is a real problem in Queensland and other tropical areas where mosquitoes are a problem, so please use some of the excellent products now on the market. There are products now which can be given once a month, which is more convenient – as long as you remember to make sure they are given! A new yearly treatment has also just been developed and is available from veterinary surgeries. Trim your puppy's toe nails regularly. Untrimmed nails can be very unsightly and are also a nuisance to your dog. Check at least fortnightly. If left untrimmed, the “quick” will continue to grow down into the nail, making them longer and longer and impossible to cut short without hurting or causing bleeding. Finally, if you are in doubt about anything at all - PLEASE ASK! Last but not least: YOUR PUPPY HAS BEEN MICROCHIPPED! Details are supplied with paperwork provided.